Finding the best softball bats can be tough, and we’re here to help you. We researched some of the most popular and bestselling products available so that you can swing for the fences. Length, weight, and drop are all important. The best softball bat for one person may not be the right fit for another. Before we jump into the reviews, know that we’ve got the breakdown on the answers you need below! Take a look before you go shopping. 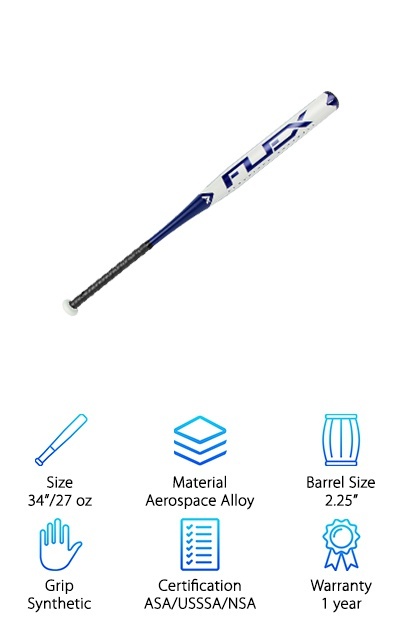 Size - This softball bats review includes lots of details for the avid athlete, and we start out with the basic stats: softball bat length, and weight. The length corresponds to your height, and some prefer heavier bats while others reach for lighter options. Material - Softball bats can be broken down into 3 categories: alloy, composite and hybrids. We will tell you what the bat is made from so that you know how it will handle on the field. The material affects the bat's heft. 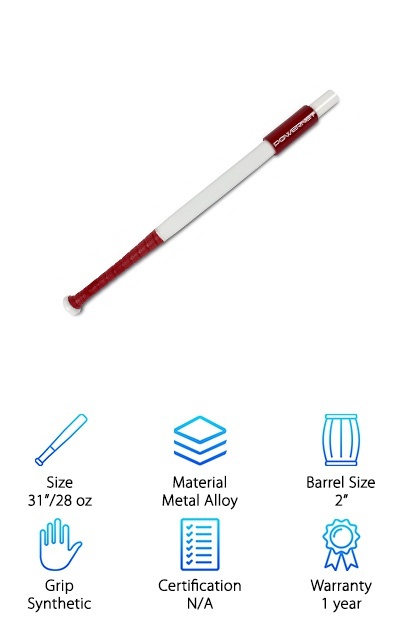 Barrel Size - Something else to look out for is the width of the barrel. While a larger barrel could mean easier hitting, sweet spot training often improves with a smaller-barreled bat. The best slow pitch bats could also mean bigger barrels. Grip - You need a bat that’ll give you a loose but comfortable grip. It shouldn’t be too sticky, and it should help dilute those vibrations coming off of a hit. The grip is pretty important! We’ll tell you what kind you’re getting. Certification - Your softball league probably follows the rules of one of the sport’s main governing bodies, and those rules extend to your bat. You need to know if the proper certification is provided so you can use it to play. Warranty - If your brand-new bat dents or breaks in the middle of a game, a warranty is a great thing to have. We’ll tell you how long you’ve got to get a replacement. It’s your backup information, just in case. Now that you know how to choose a great softball bat, let’s get right to the reviews. The best wood bats on the market are on this list. We also included metal alloy bats and more. Here’s the deal: you want the bat that will help you steal home. We want to help get you there! If you don’t have a lot of time, not a problem. Just check out our top pick and our budget pick. Let’s go! 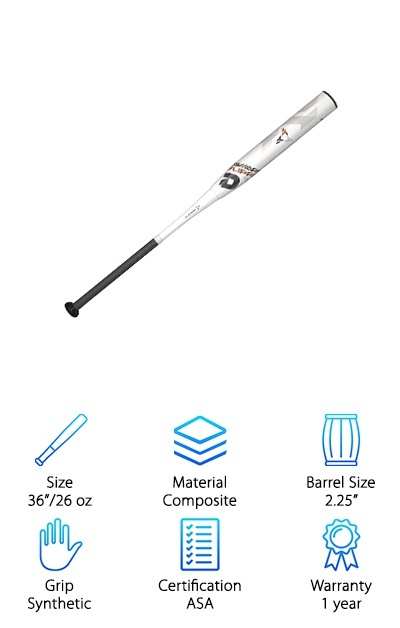 The DeMarini Steel Slow Pitch Bat is a hybrid bat, made with carburized steel and a ZnX alloy handle. This is a beautiful professional-grade bat for the serious player. And the serious player will want to know the nitty-gritty about their bat of choice, so we are here to help! Here is the scoop: this bat is designed for slow pitch softball, and it's ready to go right out of the wrapper. Check out the size information to make sure the length and weight look right for you. It is 34 inches long, weighing in at 28 ounces. You're going for that "pop" when you make contact with the ball. The bat comes highly certified, including approvals from USSSA and ASA, two of the biggest softball leagues. The best slowpitch softball bats have an even heft, and a solid grip like the synthetic one included here. With a 1-year warranty included, you can feel comfortable trying it on for size. Do you have a kid who is really excited to start their softball career? Our budget pick is the Easton Fastpitch Softball Bat. It’s the perfect starter bat for the young softball enthusiast. It’s one of the best ASA bats out there! You might be wondering: what makes it so ideal for someone just getting into the sport? The size and weight, for one! At 26 inches long and just 16 ounces, it’s perfect for introducing a love of softball. Don’t worry: if that seems like it might be on the small side, Easton has bigger bats available too. Just move up a size or two. It’s made of a sturdy aluminum alloy to really make that ball fly off and soar. The synthetic grip will help your young friend get comfortable stepping up to the plate. It’s got the right certifications, with both USSSA and ASA approvals. The one-year warranty is nothing to shrug at, either! When softball players talking about “hitting that sweet spot,” what do they mean, exactly? It’s a discussion beloved by generations of sports enthusiasts. This is crazy: there is supposed to be an optimal space on every bat designed to make that ball fly high and long. It can take a lot of training to learn the proper stance and the amount of power needed – it can also take the right bat! That’s where the PowerNet Sweet Spot bat comes in. It is slimmer than most bats, with a 5-inch red section on the barrel for training the eye to hit the sweet spot, every time. Ideally, you want to hit that red space over and over again. Practice with this all-metal bat to get that ball outta the park! This 31-inch bat weighs in at 28 ounces and features a synthetic grip. It has a 1-year warranty. Try it today to see if it can improve your game! The Louisville Slugger could arguably be called the world’s most popular bat. Even non-sports enthusiasts are familiar with the name. Millions have been sold by the Louisville Slugger company since their bat was designed in the late 1800’s. Now, that’s impressive! And who knows, the Louisville Slugger Fastpitch Bat could improve your game, too! Crafted with nearly 150 years of performance technology and experience, this bat is certified by the biggest softball leagues. It’s made from composite, a polymer similar to the carbon fiber material you see on custom racecars. It's now a popular material across several sports. Several sizes are available, ranging from 28 inches to 32 inches in length. Weights range from 17 to 21 ounces. The bat comes with a synthetic grip for helpful handling and a one-year warranty. The company’s Precision Weighting process is designed to give you an even weight from the handle to the barrel! What more could you ask for? Check it out today! Miken is another US sports gear superpower. Be a legend on the field with the help of a legendary bat: the 2017 Miken Supermax. It’s certified by the ASA, one of the biggest softball leagues in the country. Its TETRA-CORE technology and composite structure are all designed for monster hits. Composite is a polymer prized by many softball players for its reliability. 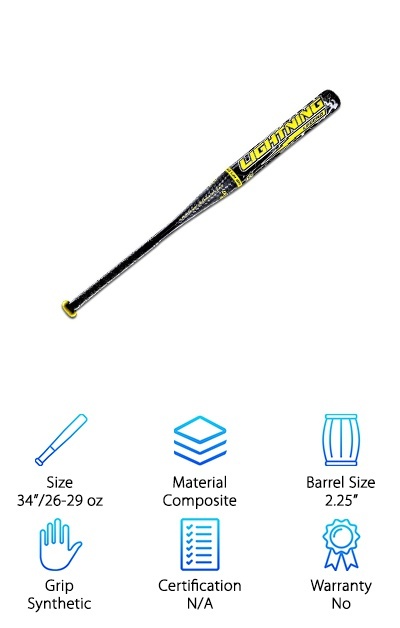 At 34 inches long and 26 ounces, it’s one of the bigger bats in our lineup. You can select a lighter Miken bat at the same length if you require less mass. And check this out: the vibrant black and neon green design will help you, and the plays you make, stand out. 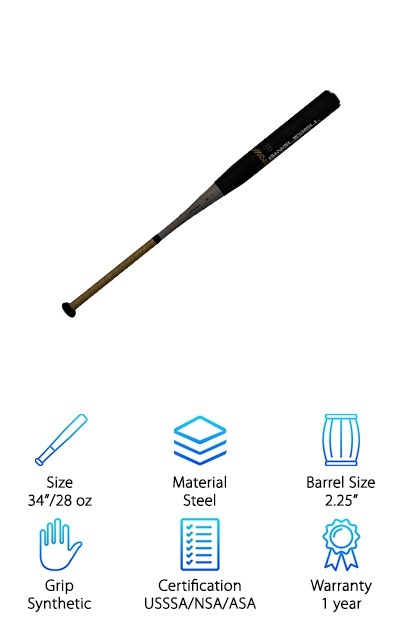 Miken Sports offers a 1-year warranty on the bat. This proud US-based organization has been making award-winning bats for decades. Our reviewers liked its reputation, its stats, and its capabilities. See if this bat can help you score all of the runs and a few high fives! The best men’s softball bats come in all different shapes and sizes, but our reviewers became fans of the SB5 Mens Wood Softball Bat for a few reasons. The best ASA softball bats are bats that allow for some serious power hitting. 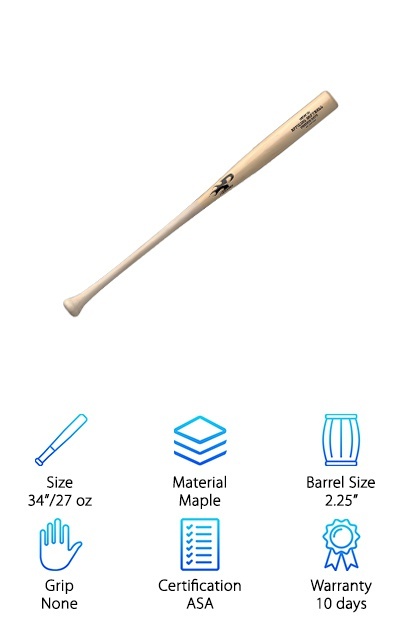 This beautiful maple bat can do that for you! Tape up the handle, find that sweet spot and swing away. Its simple, old-school design will remind you of your little league days (in the best possible way.) But make no mistake, this bat is designed for the grown-up athlete. At 34 inches long and weighing 27 ounces, it can stand up to a big, powerful player. You get to choose from that classic maple or a polished wood-and-black design. This season could be one of your best with this solid piece at your side. Who knows? Your dreams of game-winning home runs might be just a purchase away. Try it out for ten days under the manufacturer's warranty. This is another of the best ASA slowpitch softball bats out there according to our reviewers! Just look: its technical features are designed to get you monster hits, fresh out of the wrapper. One of its most unique assets is the structure of the barrel. It's made with what DeMarini calls "Divergence gap tech." It's two layers of composite material, one on top of the other. In between, they leave a layer of air. When you take this bat out to the field and let it swing, that gap is meant to extend the size of the bat's sweet spot. Imagine it: your best year yet with the team thanks to this smartly designed tool. Aside from the composite barrel, you get a ZnX alloy (zinc and aluminum) handle and a synthetic grip. The bat is certified for ASA play and comes with a 1-year warranty. Bottom line: this one is designed by the experts, so don’t hesitate! Softball players are always looking for a pop straight out of the box. For non-athletes, that translates to hit after hit with little to no adjustment period. Sounds great, right? Well, the best USSSA softball bats can do that for you. The hard part is often doing the research and finding the right bat. But here’s the kicker: our reviewers have done the work! These are our favorites, including the Easton Slowpitch Bat. It is USSSA certified, and ready to go. It’s got an advanced composite barrel attached to a black carbon handle and grip system designed to reduce the vibrations coming off of a hit. Size-wise, we’re talking a 34-inch bat weighing 26 ounces. There are options to go up an ounce or two if you prefer a little more heft. The barrel is 2 ¼-inches wide. If you’re curious about the ability to try it out, the bat comes with a standard 1-year warranty. It’s a winner! Do you need to unleash a little raw power? Are you in training or part of a league, and you need a new bat to take you to the next level? Get pumped with the Anderson Flex Slow Pitch bat. It's certified where it counts, with ASA, USSSA, NSA, and ISA. Here are some more details you’re sure to find interesting: it’s made from the Anderson Bat Company’s Aerospace Alloy. It’s designed to move lightning fast, and not slow you down. You might be asking yourself: why is lightning speed important for slow-pitch softball? That’s because the term simply refers to the difference between soft-pitch and fast-pitch softball. Soft-pitch softballs will still come at you at an average of 25 miles per hour! That's why you need to look for a bat length and weight that are both manageable for really slugging the ball. The Anderson bat is a standard 34-inch length and 27 ounces. They also make a 26-ounce bat. Kids everywhere grow up with the tale of a baseball legend that dates back to 1888: Casey at the Bat. It’s a cautionary tale, because try as Casey did, he struck out that day in Mudville. The fine people who designed the Dudley Lightning Legend Balanced softball bat worked hard to do just the opposite: to get you hit after hit! So, what are we talking about? A composite 34-inch bat with a fantastic reputation. You can pick from a weight between 26 and 29 ounces, depending on your preferences. The Lightning Legend comes from their Advanced Players Series, so you’ll feel like a real professional prepping in the dugout. The carbon fiber materials used in this composite bat are meant to last and last. Use it on game day, use it for practice… and one last thing. No one will be able to miss you as you step up to home plate with this bat and its iconic neon yellow design.